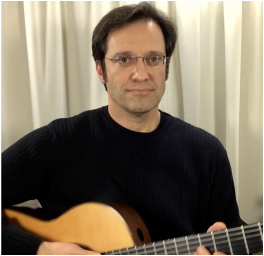 Jim Lammers has enjoyed teaching guitar for more than 25 years in Kansas City, Missouri. He is fully committed to providing the best instruction possible for each student. Anyone age 6 through adult is welcome to take private guitar lessons. Students who are new to the guitar will be playing music at the first lesson. Students who already have experience playing the guitar will further develop their guitar skills and repertoire with instruction given at the appropriate level. The majority of private guitar students enroll in lessons for an average of 1-2 years. Students who have longer range artistic goals continue with lessons for 3-4 years. Guitar Studio Philosophy - Each student will learn performance technique relevant to level and style. Music reading and theory will be incorporated in the lessons. Music listening and improvisational skills will be also cultivated. Each student will develop a personal repertoire and will be encouraged to share the joy of performing. To progress, each student will need to regularly review the lesson material. Practice at home is essential for success. Guitar Studio Policy - A new student is welcome to start private guitar lessons at any time throughout the year. Regular lesson times are reserved for 30 minutes each week. As an option, adults and experienced students may schedule coaching lessons by appointment. Payment is due at the time of the lesson or in advance. Payment for lessons may be made at the studio by cash, check or with a bank card below. There are no make-up lessons, credits, or refunds given for student absences or cancellations. In the event that the instructor is absent or cancels a lesson, a make-up lesson or credit will be offered. Contact Jim Lammers now to schedule your lessons.